In cooperation with overseas performing arts institutions and organizations, this year we introduce dance, theatre, and interactive performances from four countries (all Japan premiere). 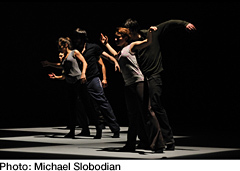 The dance piece And the Line Begins to Blur deals with the interfaces of humanity. Growing tensions between the individual and the community, the visual characteristics of the piece refer to both past and the future, creating a powerful and surreal world where brutal beauty meets the dark outlook on life. A company that has been exploring a unique style that blends street and hip-hop elements and contemporary ballet. Since 2002, the company has created works for special events and by commission for other dance companies. Loan Sharking is based on the idea of retrieving and appropriating these choreographies to create a new repertory program offering a wide perspective on the particular vocabulary that the company has developed. 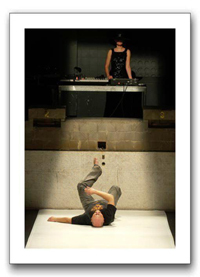 One of the pieces created in Laboratoires d’Aubervilliers' full-year project "Théâtre permanent," where plays whose titles are the names of their main caracters such as Tartuffe, Hamlet, Antigone or Woyzeck is created, rehearsed, performed and opened for citizens' experience, continuously engaging in theatre. With passion for the text, stage design with cardboards and photocopies, love songs and actors with communicative energy, this theatre performance unprecedentedly and meticulously disarranges Racine's classical tragedy. The winner of the international choreography contest Masdanza in 2007, Perrine Valli visits Japan for the third time after her residence and performance in 2009 and the performance in 2010. This piece, with comparative dialectics between Japanese couples (myouto) and Western couples, is one of her performance series that interrogates sexual identities. A provocative and original choreographic project by one of the most promising young talents in French dance. Cette pièce a été crée dans le cadre de la création Je ne vois pas la femme cachée dans la forêt en coproduction avec l’ADCGenève, SüdPol, Festival Faits d’Hiver, Mains d’oeuvres. Soutiens: DRAC - Ile de France, République et Canton de Genève, Ville de Genève - Dpt de la culture, Loterie Romande, Pro Helvetia, SSA, Reso-réseau, Institut Français, Ernst Göhner Stiftung. The theme of the spectacle is melting of ice, the very first movements breaking the stillness, breaking of ice. Awakening of suspended energy. The eruption of purifying power. The process begins almost unnoticed. Everything is dead calm. Ice plate slowly begins to crush. Melting ice takes everything redundant. Water rises step by step gently turning into mild garrulous staccato gradually bursting into uncontrolled chaos, vortex, in the end becoming a violent stream, a waterfall. It scares because it possesses the presences of destruction. Finally it appears that it is necessary for the rebirth. Vital and desired. Floe is not a choreographic solo although there is only one dancer in the piece. It is a creation based on movement within space, light and sound. It is a living image spread in time. Each participant purchases their own “house” at the door, and the venue is not a theater but a vast canvas on which the map of the city we live in is drawn. This performance is completed when the map is filled with houses that individual participants have decorated as they like, and “Yokohama,” which is special for all the participants, finally emerges. The development boasts a number of services to help settle you in—a notice board, a postal service and even a local radio station. On the final night there is a street party for neighbors where they can raise a glass and celebrate the formation of their unique community. This project takes part in Creative City Artists-in-Residence Exchange Program. If death is the only desire to be accomplished, we who are ‘alive’ are surrounded by desires that cannot be fulfilled. Jeong’s movements are desperate struggles to fill up our empty spirit. Though it may seem bold and ludicrous, various attempts revealed by her transforming body are enough to inspire our imagination. 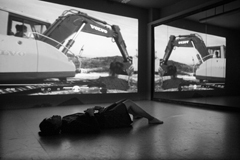 This piece includes a film about the artist’s work, followed by her own narration, and a live performance. The elements of theater, dance, drama film and documentary film appear on one stage, mixed up altogether. Even in the moments of ambiguity and distraction, we notice that these are the very moments we stick to true thinking.